Another fun and creative success story from Laika, the first name in stop-motion animation, and what is quickly becoming the greatest animation studio around. A pretty creative movie about a society of upper class townspeople and their strange priorities. These characters are obsessed with cheese and wear white hats as a status symbol. And that’s just the start. This movie has no shortage of ideas. There are the boxtrolls who live underneath the ground and the boy who lives with them. Then there’s the villain, Snatcher and his henchmen, who promise to catch and kill all the boxtrolls in exchange for getting white hats of their own. This leads to that boy, Eggs, having to come to the surface, rescue his boxtroll friends who have been kidnapped, and show the people of the town that the boxtrolls aren’t what they think. The movie is strange but fun. 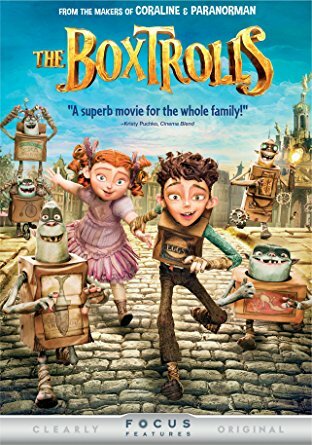 If Coraline, (also by Laika,) was a bizarre, but contained movie, taking place almost entirely inside of a house, then The Boxtrolls is the studios strange and not contained movie, out in the streets of this town, both above and below ground. The movie showcases the different classes of society as major parts of the story. It all works out pretty nicely to be a unique artistic experience and a fun and entertaining film. The Boxtrolls is another great movie from Laika, the studio that makes all the stop-motion animation movies. These guys have made four so far, ending with their best film yet, Kubo and the Two Strings. Coraline was another great one of theirs. And The Boxtrolls is almost as good as that. Their only movie that wasn’t great, in fact, was Paranorman, and that was because it didn’t quite do enough. It was more of a simple story about ghosts and zombies and a curse. Every other Laika movie explores more than just creatures. It explores a whole other world. The Boxtrolls is no exception. This movie explores a world where adults of the upper class live in a society where there are only two things of importance to them. Their white hats and cheese. They are obsessed with cheese and have tasting parties where a small handful of men (usually about three or four,) sit around a table tasting the different cheeses together. The way that it is a sort of man’s club is definitely reminiscent of the olden times, and this movie certainly feels like it could fit in with a story about the old days in a country like France or Belgium. At the start of the film, we meet Snatcher (Ben Kingsley,) as he comes to the door of Lord Portley-Rind (Jarred Harris.) Snatcher is of the lower class, and a criminal. 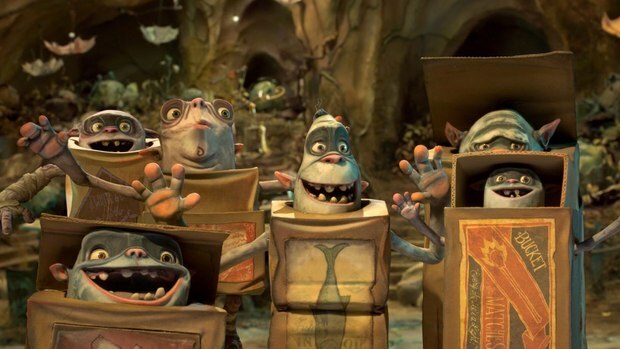 He reports of the kidnapping of a baby by these creatures known as the boxtrolls. They live underground and wear boxes around their chests and waists that they can hide inside of, when sitting on the ground. Lord Portley-Rind doesn’t really care about the kidnapped baby. He says that it’s awful and all that, but when Snatcher asks for a white hat if he catches all the boxtrolls, Portley-Rind laughs and tries to have him thrown out of the house. But then Snatcher mentions that the boxtrolls might come for the cheese next, and suddenly the door is flown back open, and a deal is made. If Snatcher and his men can kill all the boxtrolls, then he will be given a white hat. Snatcher’s dream is to wear a white hat and be invited to the cheese tasting parties. The irony that he is incredibly allergic to cheese and blows up like a giant blimp when he has some. But Snatcher doesn’t seem to care. He wants to be a part of the upper class, and do anything to achieve that status. And all of this comes from the fantastic opening scene, on the doorstep of Lord Portley-Rind’s house. After that, we see the boxtrolls in the street at night, hiding in their boxes until the coast is clear and it’s time to come out and party. For them, a party is going around the alleys, tearing through garbage, and looking for interesting items that people have thrown away. Of course, they don’t know what any of these items are or do, but that only makes them all the more interesting to the boxtrolls. And then they take these items, run to a slide, and take it back down, underground, to their home. That’s when we meet Eggs. He’s a human and his box says eggs on it, because that’s the item that was once stored inside of it. Eggs is the baby who was kidnapped at the start of the film. Now he’s a boy, and has been living with the boxtrolls ever since the kidnapping. They have raised him, and he is particularly close to one of the creatures who he calls Fish, (again because of the fish image on his box, for what it once held.) Fish and Eggs make music together, and it’s the kind of music that one might find being made in a junkyard, involving using the trash items around them, and even breaking things, like light bulbs, to the sound of the beat. Before that realization, however, the henchmen spend their evenings going around trying to catch the boxtrolls, and they’re generally pretty successful. We see the number of boxes that pile up on top of each other to go to sleep at night, decrease in size, over an over again. Pretty soon there’s not too many of them left, and that’s when we see the henchmen kidnap Fish. When Eggs returns home to the underground lair that night, he is depressed, and nothing the other boxtrolls can do can snap him out of it. He’s just lost his best friend, and also his father-figure. And so Eggs decides to go on a mission to get Fish back. That means traveling up to the world above ground on his own. There he meet Winnie, who saw him out at night with the boxtrolls, and has been curious about this strange boy ever since. Winnie believes the boxtrolls to be vicious monsters who eat the bones of humans and drink their blood. She asks Eggs if that’s what the boxtrolls did to his parents, and “did they let you, I mean, make you watch?” She wants to believe the boxtrolls are terrible, not because she hates them or anything, but because the idea of these scary monsters who do terrible things is kind of fun. She’s a great character, and in this movie where the kids are smarter than the adults, she represents the intelligent, adventure seeking girl (what used to be called a tomboy, then a feminist, and is now called an independent woman,) perfectly. Eggs brings Winnie down to the box troll lair and shows her the truth about the creatures. That’s when she decides to help him reveal the truth about Snatcher and his henchmen. 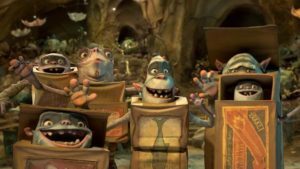 They start by visiting the hideout of these villains, and learn that the boxtrolls are being made to do hard labor, in order to build something. What they are building is left as a mystery, but it’s something big that’s saved for the climax of the film. In the meantime, Eggs and Winnie barely escape the hideout, and then find themselves at a party in Lord Portley-Rind’s house, trying to tell Winnie’s father the truth about the man he has hired to rid the town of the boxtrolls. Like Coraline, there are tons of weird, out there, ideas here, and that’s what makes the movie so appealing. From the cheese obsession and white hats to the idea that Snatcher dresses as a woman and seduces all the men at the upper class parties, this movie is very strange. And that’s a good thing. It isn’t afraid to tell a bizarre tale and find creativity whenever and wherever possible. It also finds humor more often than one might expect, and that includes making the villains occasionally seem sympathetic. Snatcher wants so much to be a part of that upper class society, for example, that he holds his own cheese tasting parties with his henchmen and makes them all wear fake white hats to act the parts. This movie does start to feel a little routine by its end, with the big climactic showdown in the streets, but for most of the way through, it’s a unique film filled with bizarre ideas that really work. The boxtrolls are cute good guy creatures, and the tale of the boy who was raised by them and now has to save them, turns out to be something kind of fresh and unique. In the hands of Laika studios, it’s the perfect fit.